HISTORY is repeating itself in the men’s segment of the fashion industry. With Indian males turning increasingly adventurous in their sartorial tastes, this much-neglected area of formal dressing has once again merged into focus. Soon men started strutting about like peacocks at ghazal soirees and marriage functions, matching women cut for cut, colour for colour. What escaped public perception was that before the British Raj (when western attire was introduced), Indian men were just as flamboyant in their dressing. History is once again catching up, though with some improvisation in traditional items of men’s clothing. In fact, a few designers like Wendell Rodricks, Aki Narula, J.J. Valaya and Krishna Mehta have become specialists in this field, while lending their own interpretations to male ethnic wear. Accordingly, the angarkha (literally, a cover for the body) which is Rajput in origin with a typical round collar, is now being designed with an elongated neck which gathers at the waist. The western influence is apparent in the overlapping or what is known as the double-breast cut. Likewise, the achkan or sherwani, is being transformed from a regal outfit (of Mughal courts) to a rather westernised suit jacket. It is long, with or without side slits and is traditionally worn with churidaars or Aligarh pyjamas. Today, the pyjamas are being replaced by long, narrow trousers with gathers at the ankles. Sherwanis with Chinese collars are worn with long-sleeved western shirts or kurtas without collars. A shorter version of the sherwani is also in circulation. Resembling the closed-neck (bund gala) Jodhpuri jackets, it has staged a comeback after former Prime Minister Rajiv Gandhi made it fashionable in the late eighties. 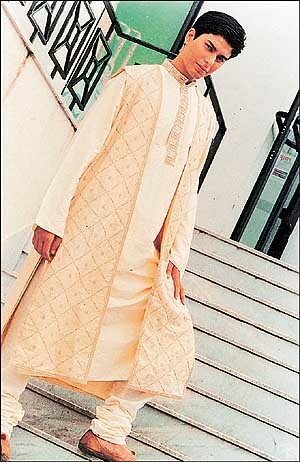 Then there is the kurta — by far the most popular ethnic garment for men. With the availability of newer fabric options, no longer is it treated as an item of casual wear. Kurtas are now being made in assorted cuts and lengths, with or without collars and coordinated with elaborate waistcoats or jackets. Designers like Hemant Trivedi prefer to team up kurtas with trousers, while other like J.J. Valaya, Shobha Somani and Krishna Mehta are pitching for a dhoti option. It is an unstitched piece of cloth, approximately three metres in length and could vary from cotton muslin to silk and brocade, depending upon the weather and occasion. The dhoti is traditionally tied around the waist in a manner that divides the legs so that it emerges like a billowy trouser. As dhoti-tying has become a forgotten art, it is now being prestitched so that the man can simply step in and tie it up. Apart from being teamed with kurtas (as Bengalis would prefer), the dhoti is teamed with long knee-length shirts and more significantly, with pherans. Traditionally, these loose kurta-styled shirts used to be worn with salwars. But now, somehow salwars are out of favour with Indian men.